Following the example of Jesus when feeding the crowd with just 5 loaves and 2 fish, this ministry’s goal is to feed the hungry of the Brookings area through a weekly grocery distribution. How Does Feeding Brookings Work? From 4:00-5:00pm each Thursday afternoon at Ascension Lutheran Church in Brookings, SD, volunteers distribute produce and bakery items provided by our local Wal-Mart and Hy-Vee stores, canned goods from The Emergency Food Assistance Program, hygiene items, and a food item of the month as well as any donations from local churches and community members. There is no need for guests to arrive early; random numbers for order of entry are drawn on the day of distribution at 3:50pm. All in need are welcome. Each household will be required to complete one form each year. This is just for the government to see an average of income. If you make above the poverty guidelines set forth by the government, you are still able to receive food, it's simply a different form you will fill out for our records. BATA provides free rides to and from Feeding Brookings. The rides must be arranged 24 hours in advance by calling 692-2222. Same-day rides are $5 each way. If you are in need, or would like to help our neighbors in need, spread the word! 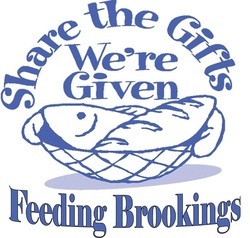 Click HERE for a pdf informational flyer about Feeding Brookings. Feeding Brookings is a United Way sponsored organization and an equal opportunity provider.